Check out these testimonials to see why Blademaster is The Choice of Professionals. "We appreciate your help and continued partnership over the years as well and look forward to working with you for years to come. The new machine here not only works awesome, but the height is great for us and the exhaust works very well. Not to mention the custom paint job and USAH logo." "We are very happy with our new machine, being able to have 2 guys sharpen at the same time is a huge benefit for us. I have also been very happy with the new exhaust system. I have had many comments on the great look of the machine! Being able to use our team colors and design the look of the machine is a great benefit. Thanks Blademaster and NESSI for the continued great service." 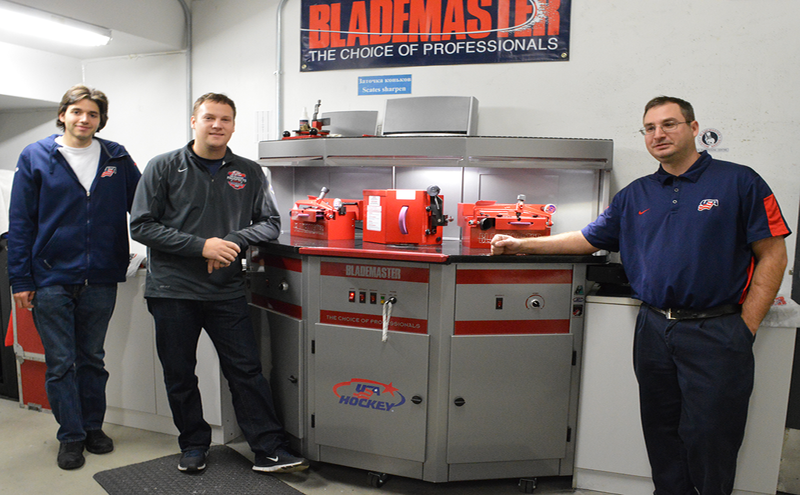 "We're fortunate to have a great partner like Blademaster. We have eight portable machines to start the season, four in North America and four we ship to Europe. By the end of the season, the machines get beat up from all the travel, but Blademaster's durability shines through. And it's always backed up by great service and support." "My experience with Blademaster has been fantastic. The service is top-shelf. The product is top-shelf. I highly recommend it to anybody - any of my colleagues or anyone in the retail side looking to do something with skate sharpening. They have by far the best product in the market. I've been using it since Lake Superior - I've always sharpened skates using a Blademaster." "I just recently switched back to a Blademaster machine - over the last seven or eight years it's amazing to see the change in machinery. The PLATINUM machine they have today is wonderful. It's got a clean filtered exhaust, the machine is quieter, and the tabletop made of granite allows for a smooth surface to work with." "I always had Blademaster machines at home, in the practice facility, and on the road. I like the product, first of all, and it comes with great customer service. Blademaster does an awesome job. Again, customer service is second to none. It’s the type of service we need in our line of business." "It's all I've ever used; they've always taken good care of me. Everything works great and it's built to last and that makes my job a lot easier."